Sydney Chaplin, Charlie Chaplin's son, has died at the age of 82. Charlie wrote in his book that he really never knew his father. Charles Sr. was a London Music Hall singer for many years and even traveled to America and performed in New York. Charlie lived with his father for a short of time during his childhood. Charles Sr. died May 9, 1901, at the age of 37 from illnesses stemming from alcoholism. Charlie's mother Hannah became a singer in the London Music Halls after marrying Charles Chaplin Sr. in 1885. She had one son Sydney at the time of the marriage. She appeared under the stage name 'Lily Harley', and for a few short years, the couple made a comfortable living singing at the London Music Halls. It was during this period that Charles Spencer Chaplin, Jr. was born on April 16, 1889. But the Chaplin marriage ended after Hannah was caught having an affair that resulted in birth of a son fathered by another Music Hall singer Leo Dryden. Charlie Jr. was too young to know what was going on and would not fully know about his half brother Wheeler Dryden until many years later. Soon after, the Chaplin family's comfortable life came to an end. 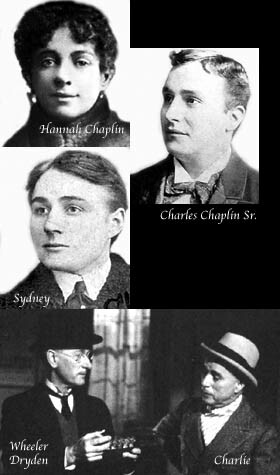 Charlie's family - His mother Hannah, top; his father Charles Sr., right; Sydney, center left; and Wheeler Dryden and Charlie in 'Limelight', bottom. During Charlie's and Sydney's childhood, Hannah suffered from mental illness and had to live under care for many years. Charlie and Sydney lived in many different homes, schools and workhouses during this time, but the home they remember most was the one at 3 Pownall Terrace. Charlie would visit that location years later. His memories of it can be see in the room Charlie created as his home in 'The Kid'. Hannah would suffer with mental illness for the rest of her life. Charlie and Sydney loved their mother. They clearly remembered her entertaining them as children and inspired them through their tough childhood. They brought their mother to America in 1921. Charlie purchased a California home for Hannah and had special people to care for her where she lived her last years. She died August 28, 1928. Charlie had two half-brothers. Sydney Chaplin grew up with Charlie and was the one person who really knew Chaplin the best. Wheeler Dryden did not get to know his famous brothers until Charlie was well into his film career. Wheeler tried to contact Charlie but was unsuccessful. Dryden decided to write Edna Purviance instead. The thoughtful and detailed letter is still in the Edna Purviance Collection at BFI Library in London. Edna had to be touched and knew a lot about siblings, since she was very close to her two sisters, Myrtle and Bessie. Wheeler had one son name Spencer Dryden. Spencer became famous as the drummer for Jefferson Airplane and was with the group throughout the bands best years. Spencer Dryden was inducted in the Rock and Roll Hall of Fame in 1996. Spencer died from cancer January 10, 2005. Sydney Chaplin was Charlie's business manager as well as played roles in the films 'Shoulder Arms', 'Pay Day', 'A Dog's Life' and 'The Pilgram'. Sydney and Charlie were very close and visited each other well into their later years. Sydney had no children and was married twice. His first wife, Minnie, died, but Sydney remarried a french girl name Gypsy. The couple lived in both America and France, with their last years being in Nice. Both marriages were happy ones for Sydney. Sydney, 80, died on Charlie's birthday on April 16, 1965. Wheeler Dryden died September 30, 1957. Charlie Chaplin was married four times and had 11 children between 1919 and 1962. This is a list of the marriages, children and brief information of interest. They were married October 23, 1918. The couple had one son Norman Spencer Chaplin born July 7th, 1919. The baby died three days later. The couple divorced April 4, 1921. They were married November 26, 1924. They had two sons: Charles Spencer Chaplin, Jr. - born May 5, 1925, and Sydney Earle Chaplin - born March 30th, 1926. The couple divorced on August 25, 1927. Charlie's Jr. played in 'Limelight' as one of the clowns with his father. In 1960, he wrote the book about his father titled 'My Father, Charlie Chaplin'. Charlie Jr. died on March 20, 1968. Sydney played with his father in 'Limelight' in the role as Neville. He still attends Chaplin events held for his father and can be seen in film interviews about Charlie. Sydney died March 3, 2009. Chaplin and Goddard were married on a trip while traveling near Japan and China in 1936, but the legal papers were ever made public during the time of their marriage. They made two films together 'Modern Times and 'The Great Dictator'. Paulette became a beloved step-mother to Charlie Jr. and Sydney. The couple divorced in June of 1942. It was at this time the marriage was said to have taken place in The Orient six years earlier. Geraldine was an actress known for many roles, but first recognized for her work in 'Dr. Zhivago'. She also played her own grandmother in the 1992 Richard Attenborough film of 'Chaplin'. Her first film appearance was in 'Limelight' with brother Michael and sister Josephine at the beginning of the film. Appeared in 'Limelight' with his sisters in the beginning and played the boy 'Rupert Macabee' in 'King of New York'. Chaplin had many homes during his childhood, but they were either rentals or rooms at workhouses. The one place he remembers as his 'London home' was called 3 Pownall Terrace. He would return to that location during his visits to London, but he had no family home to return to, only the street and building locations he remembered as a child. During his career, Chaplin owned two homes, but none at the beginning of his film career in early 1914. Instead for many years, Charlie rented a room at the Los Angeles Athletic Club. He and Sydney were not sure how long their careers would last and were always ready to head back to London, if things did not work out. And even after Chaplin's career did take off, he still preferred his club room to a home. 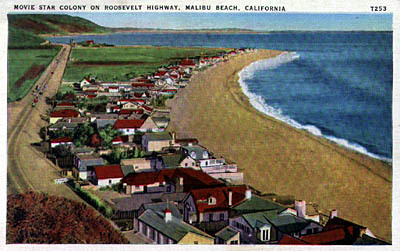 During Charlie's marriage to Mildred Harris he rented a home on 2000 De Mille Drive, but during the break up he moved back to the Athletic Club. After Chaplin's return from his 1921 London and European Tour, his friends Douglas Fairbanks and Mary Pickford finally talked him into building a home near their fame estate called 'Pickfair'. The land once was an open hillside where the locals rode their horses. The hill became the 'home of the stars' in the silent film days. Chaplin's home was finished in 1923 and was designed by Chaplin. It had 14 rooms, a swimming pool and the most interesting feature, a fully installed pipe organ. Later a tennis court was added which Chaplin enjoyed while having Sunday Tennis parties. Chaplin lived in his Summit Drive home until his family trip to London with Oona in September of 1952. Chaplin would never be able return to the California home he loved when he was denied re-entry to the U.S. by government officials. He sold the house in the 1950's. His second and final home was Manoir de Ban, Corsier sur Vevy Switzerland. Charlie and Oona raised their eight children at the Manoir de Ban during the 50's, 60's and 70's. Chaplin passed away at his home on Christmas Day 1977. The family continued to live at the home. Today it is being turned into the 'Charlie Chaplin Heritage Center', the current name for the project. Chaplin also owned the home he brought his mother to live in during her later years in the 1920's. This home was in the Los Angele area. Special knowledgement to the books 'Chaplin, His Life and Art' by David Robinson, 'My Autobiography' by Charles Chaplin, 'My Life in Picture' by Charlie Chaplin, 'The Chaplin Encyclopedia' - Glenn Mitchell , 'My Life with My Father' by Charles Chaplin Jr. and 'My Life With Charlie Chaplin' by Lita Grey Chaplin. Charlie Chaplin is a trademark of Bubbles Inc. SA used with permission. Charlie Chaplin, Chaplin and the Little Tramp, the images of Chaplin's on this website and the names of Mr. Chaplin's films are all trademarks and/or services marks of Bubbles Inc. SA and/or Roy Export Company Establishment used with permission. All Charlie Chaplin images Copyright 2001-2016 Roy Export Establishment. All rights reserved.